Assembly Coffee prides itself as part of the third wave coffee movement. Every cup of coffee is brewed and created with dedication. It is not by chance that the latte art is pretty, and if you look across all the tables, you would realise the consistency and effort behind every cuppa. The food menu is concise. There are sandwiches such as Egg Mayo (S$11.90), Scrambled Eggs Croissant (S$13.90) and Pulled Pork Sandwich (S$14.90); as well as light bites like Smoked Salmon Salad (S$12.90) and Chicken Pie (S$9.50). 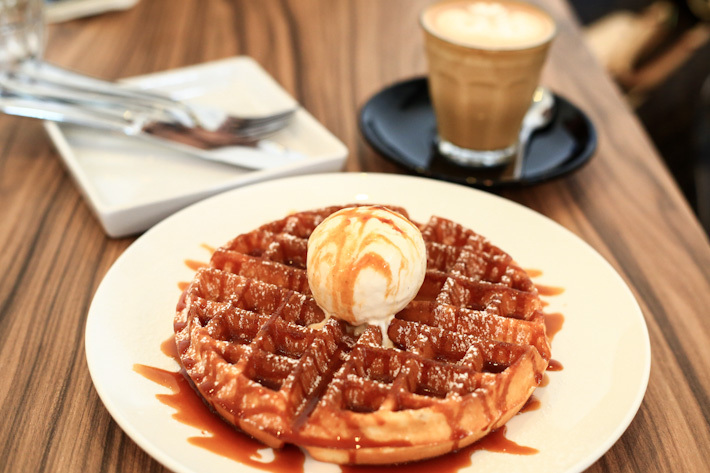 If waffle is your thing, the Salted Caramel waffle (S$11.50) will have you dancing for joy. It impresses with its crisp edges and when paired with a scoop of vanilla ice cream, it makes a good dessert after a meal, or simply an ideal afternoon snack along with a cup of cappuccino. The other option is a Chocolate & Strawberries Waffle (S$11.50). Among the numerous new cafes in Singapore, Assembly Cafe stands out for its commitment towards serving good coffee and simple comfort food. The cafe is already getting popular, and it can be quite difficult to get a table during the weekends. If you pass by the area during a weekday afternoon, we highly recommend dropping by for a cup of coffee. 1. Hair found in salad. Yup. We know now. Left a sour taste after my chocolate and strawberry waffle. Just so you know. Guess my friends whom I brought for their first time won’t be coming back. Just so you know.